There are several options to get rid of pesky and unwanted snails and I have discussed on this topic previously on my other post on how to get rid of snails the natural and effective ways. Basically rather than picking up each and every one by hand that you can see, there are other options as well which are less time consuming. Furthermore, looking and eliminating the snails this way might not be effective at all, taken into consideration that there might be hundreds of young juveniles newborns probably hidden away among the plant leaves making your job difficult and don’t forget there might be those which have not yet hatch that would most probably gone unnoticed without realizing at all. Using Snail Eating Fish (a term used to describe fish that will eat snails as snacks) is perhaps one of the best ideas and considered a fast and effective approach because generally in order to get started, you will only need to check on the fish compatibility aspect. As I have already mentioned throughout my aquarium fish topics, doing this compatibility check is necessary and crucial because different types of fish has different tolerance limit towards other species and as such it is good to confirm whether introduction of new pet fish friend can disrupt the peace and harmony of the aquarium system. 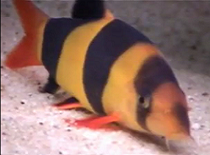 One of the so-called snails eating fish that I would recommend that you get to contain your snail infestation problem is the Clown Loaches. Being a favorite among hobbyist for its moderate care requirements and an active shoaling fish, introduction of these loach species will usually help you to reduce and eliminate the snail population in no time. Loaches while considered a very good alternative solution rather than manually picking up the snails, sometimes has its own limitations. Despite being an effective hunter which does a wonderful job, the fish can sometimes cause havoc to your aquarium community especially if you have small sized fish like the neon tetra, pencilfish, danios and others problems associated with having them around is that they are notorious for devouring eggs laid by your other community fish. Therefore to avoid the hassles of going through extra work needed to take care of them later part, before buying a new clown loach usually what I did previously to is ask a favor from a fellow hobbyist who owns one and borrowing it just for a short period of time. You might need a good friend though as nobody would want to part with his pet just like that. If this is not an option, luckily there are other fishes that eat snails as hungrily as the loaches. One of them is a freshwater puffer fish. Little is known about this species as I’ve never had one before so it’s rather impossible for me to write about them. But however, based on my own experience relayed to me by a friend who owns this species, these cute little critters can also hunt down snails as effectively as what you would expect. So there you have it, two of the best fish for eating snails and they are the clown loach and the other is a freshwater puffer.